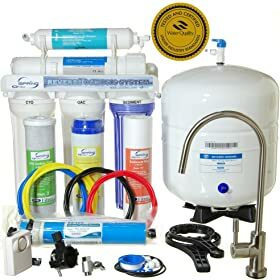 Are you looking for a good water filtration system and wondering where to get the best quality product? The truth is, there are so many options when it comes to water filters but there are very few great ones. One of the best brands in the market is the iSpring reverse osmosis water system. The company is located in Georgia and is specialized in water treatment systems both for commercial and residential purposes. 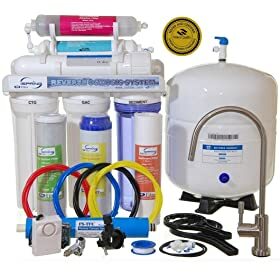 The brand has a wide range of options when it comes to water filtration models, such as shower filters, counter top, under-sink, whole house, ultra filtration and reverse osmosis systems. 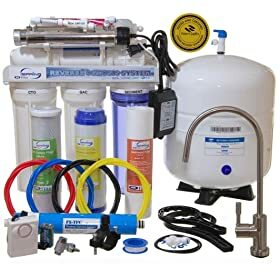 If you are looking for the best iSpring reverse osmosis system for safe water usage, just hang on as we guide you through some of the best models in the market. The first model in this reverse osmosis system review is the Ispring 75 GPD water system. It is a 5-stage filtration process which traps particulate matter such as silt, rust, and dirt that may affect the appearance and taste of your water. This filtration mechanism also plays a major role in reducing the chlorine odor or taste as well as removing halogenated substance, phenol, hydrocarbons, poly aromatic, BTEX, and mineral oil. The second stage of the water filtration system is the denser carbon filter which removes any taste and residual ordor that may still be in the water. There is the addition of UV and AK stage to help improve the quality of water and provide the best drinking water for your overall health. The system uses a methodology for pressing out water through a semi-membrane to allow only water molecules and trap other contaminants that may be very dangerous for human consumption. Although not the cheapest model around, Ispring RCC7 provides efficient water filtration capacity that outweighs the cost you pay for the system. It makes use of the same technology used in manufacturing bottled water by pressing out water molecules under a pressurized system to effectively remove sodium, copper, chromium, perchlorate, lead and arsenic. One wonderful thing about this model is the fact that you will get all your important minerals intact in the water as the system adds some minerals such as calcium and magnesium to maintain their healthy status. Ispring RCC7 removes parasitic cysts such as cryptosporida and giardia. These cysts can cause a lot of harm as they are responsible for most of the stomach upsets in the body. Moreover, choosing this system makes it cost effective because you will be avoiding unnecessary expenses on bottled water. It rejects up to 99% of germs and contaminants such as fertilizer, drugs, pesticides, arsenic, lead, fluoride and chlorine. Ispring RCC7 is an efficient and cost effective technology that provides high quality cooking and drinking water at any time of the day. Here is an improved model on the previous ispring model above. It adds alkaline into the system which restores magnesium and natural calcium during the reverse osmosis purification system. It incorporates calcite technology, carbon block, granular active carbon and polypropylene sediment for extra purification. iSpring RCC7AK has a luxury design, featuring ceramic valve and brushed nickel which adds elegant look to the kitchen. Installing the system is quite very easy with its 3/8 inch adapter that quickly connects to the cold water valve. This model is very portable and has a storage tank. iSpring RCC7AK is extremely very durable and more efficient than most other types of reverse osmosis systems. It equally comes with automatic shut-off valve, helping you save water during a reverse osmosis filtration process. It is equally designed with high grade carbon for better absorption capability and more consistent quality. iSpring RCC7AK has one of the strongest membranes in the industry based on customer reviews and high ratings. As mentioned before, this product is very simple to install because of its instructional manual that provides clear setup instructions. This is the granddaddy of all iSpring reverse osmosis water filtration systems. It provides a comprehensive water filtration technology that beats most other types of RO systems. iSpring RCC7AK has automatic and smart design, has upgradability of the system, is noise free with solid construction, has easy maintenance and very durable. This system has absolutely durable components and has the highest filtration capability among all types of iSpring RO models. It is also reasonably priced and has great water taste. Although a lot of people have complained about the difficulty of its installation, setting up this system is pretty straightforward if the user manual is carefully followed. The manual has easy-to-read 8-step installation instruction, detail figs and features updated parts list plus youtube installation video (paper version). Other features include genuine cartridge, gold seal certified product, cost effective technology and restoration of natural minerals. If you are looking for the best reverse osmosis system, this model will definitely provide the best for you. But if you are not comfortable with its installation, you can always contact a technician to install it for you. Apart from the quality of the product, users have really lauded its customer service. There are good products and there are great products. iSpring RCC7AK falls under the latter category. If your concern is a high quality drinking water that is tasteless and free of contaminants, do not settle for any other model than the iSpring RCC7AK reverse osmosis system. You will definitely enjoy its water filtration capacity. Ispring has dominated the water filtration industry for many years now. The reason for their dominance is not farfetched: they have remained the most outstanding brand for producing high quality filters that are efficient and very durable. If you really want a system with perfect filtration capacity, you are definitely at the right place. This iSpring reverse osmosis system reviews are all about the best iSpring water system. They are not just the best in the brand but also one of the best in the industry. They are therefore, highly recommended for those who want the best filtered water for their overall well being.